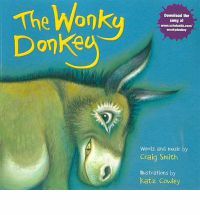 The description of the donkey is fun and more than a little silly. This book has great rhythm, rhyme and repetition, all great things to have in a book for younger readers (listeners). It was a winner of the APRA Children’s Song of the Year in 2008 and comes with a CD. I find this to be a wonderful book that encourages interaction and in the case of children like mine much shouting and giggling.